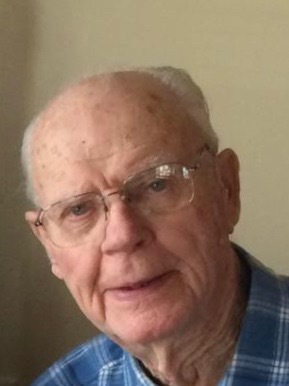 VANCE LEROY "BUD" EBERT, age 94, of Luverne, died Monday, April 9, 2018, at the Minnesota Veterans Home in Luverne. He was born in Worthington, MN on February 17, 1924, to Charles W. and Maude (Isabelle Moody) Ebert. In 1926, the family moved to a farm near Clear Lake, SD where Vance attended school, graduating in 1942. After high school, Vance worked on the family farm and at the Watertown air base in construction before being inducted into the Navy in 1945. Vance served on active duty for 10 months and as a member of the Naval Reserve for four years. Vance married his high school sweetheart, Doris Helen (“Tootie”) Warner, on his 23rd birthday in 1947. Vance and Doris moved their family to Luverne, MN in December 1955, after Vance accepted the position as manager of the Luverne Farmers Elevator, a position he would hold for more than 33 years. The couple had three sons, Charles (“Chuck”), James (“Jim”) and Paul. Vance and Doris were also loving parents to five foster children over the years. Following his retirement from the Elevator, Vance was a campground host at Blue Mound State Park and also spent many years working at Papik Motors. Vance was a dedicated member of his profession, the Church of St. Catherine, and the Luverne Community, serving on many boards including Land O Lakes (17 years), Luverne City Council (13 years), Chamber Council, the Regional Rail Authority (serving as Chair), St. Catherine’s Building Committee (serving as Chair), the Regional Development Commission, and the Private Industry Council, to name a few. Some of Vance’s fondest memories include being invited to the top of Mount Rushmore for observation of its construction in 1942, attending the World’s Fair in New York in 1964, and participating in the People to People tour of Denmark, Sweden, Norway, Finland, Russia, and Germany in 1972. Vance will always be remembered for his quiet demeanor, strong wit and sense of humor, and for inspiring the family’s infamous “Chicken in the Can” Award. Vance is survived by his daughter-in-law, Terri, of Luverne, his son, Jim and his wife, Mary, of Truman, MN, his son, Paul and his wife, Dyan, of Big Lake, as well as six grandchildren and their spouses (Katie and Matt Mostad, and Amanda and Eric Lammert, all of Luverne; Sarah and Paul Zebe, Adrian; Jessica and Ethan Harvey, Wrenshall; Jake and Nicole Ebert, Truman; and Laurin Ebert, Big Lake), and 10 great-grandchildren (Jordyn Harvey, Peyton Franzen, Riley Harvey, Charlie Mostad, Ingrid Mostad, Daphne Zebe, Gage Zebe, Tatum Zebe, Alex Ebert, and Reese Ebert). He was preceded in death by his parents; his wife of nearly 70 years, Doris (who passed away on June 26, 2016); his first born son, Chuck, on June 14, 2002; and his siblings. The family would like to extend a special and heartfelt thanks to all of the employees of the Luverne Veterans Home who provided excellent care to Vance for the last sixteen months. A Memorial Mass will be 11 am Saturday, April 28, 2018, at St. Catherine Catholic Church, in Luverne, officiated by Fr. Thomas Jennings. A time of fellowship will be one hour prior to the service at the church. Burial of cremains with full military honors provided by the Luverne American Legion & VFW will be at St. Catherine Cemetery. Arrangements are being made by Dingmann Funeral Home & Cremation Services in Luverne.